The Eucalyptus cinerea grows to an average of 20 to 30 feet tall. Young leaves are round, grey-green, and about 1 inch in diameter and grow opposite each other on the stem. They become longer, more oval shaped with pointed ends as they get older. The flowers are a creamy white and grow in 1 inch clusters. The bark is reddish-brown and fibrous. The Eucalyptus must grow in sunny, dry climates because it does not tolerate cold weather. 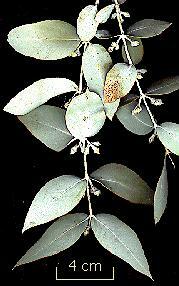 Eucalyptus trees are found commonly in the plains and savannas of Australia. The Eucalyptus tree serves as primary food to the koala bear. Bees are attracted to the flowers of theEucalyptus, and the honey from these bees is highly prized in Australia. Because of its aromatic and long lasting quality, the young leaves are a "best seller" in flower stores. Doctors and herbalists around the world use Eucalyptus in medicines to treat many sicknesses such as: infections, colds, flu, sore throats, bronchitis, pneumonia, aching, stiffness, neuralgia and even some skin infections. Eucalyptus trees are native to Australia, but they are also found in the western United States, especially in Arizona, California, and Nevada. They can be planted anywhere where there is a hot, dry climate. Dobelis, Inge. (1996) The Magic and Medicine of Plants. Pleasantville, NY: Readers Digest Inc.
Chevallier, Andrew. (1996) The Encyclopedia of Medicinal Plants. New York, NY: The DK Publishing Company.